@RunBooRun I'm in California. Only 6 weeks of the bonding is paid, but I've saved up enough PTO to cover our finances. I'm crossing my fingers that my manager will allow me to take an additional 30 days personal LOA so I can stay home with the baby a bit longer. @EnglishTeacherMama I only get 2 weeks paid leave 10 days to be exact. It's crazy. My goal is to be out for the rest of the year. I'm planning on working right up until I go into labor. Last time I was in labor at work (though I didn't even realize it...). I'm planning on take 12 weeks FMLA and disability which was 60% ---may have changed with the new policy provider. @longliveregina thank you for making that comment. I think I also feel guilty because I was laid off at 3 months pregnant the first time, this put me into a bad depression because I've always been a worker. I had it in my head that I should be working til I go into labour but you're completely right, realistically my job is to take care of myself and baby and I shouldn't feel guilty having a couple weeks to physically and mentally prepare. Also side note. We found a new listing for a house yesterday with everything we need. Closing date? March 3rd. So I'm pretty glad and thankful I chose my leave March 1st. Due date March 17th so I will absolutely need that time to pack and move my family. Where will I find the energy? How exciting about your house! You know, we took possession of our house when I was 37 weeks...I was induced exactly a week later. Even though I was so tired, the excitement of the move and our new journey was really enough to give me that energy boost to get it done. I also had lots of help from family. Nesting instinct didn't hurt either: it was the most organized move you ever saw, lol. I'm working till the end but can also WFH. Honestly there's nothing to do those last few weeks except sit and wait and obsess over The Bump, so I like the distraction! Wow I feel so bad, I had no idea you guys have it so rough in the US.. In Canada we pay into employment insurance every paycheck and then we get 17 weeks maternity leave and 35 weeks parental leave after that. They only pay you 55% of your income but still! I guess that I don't understand. FMLA only covers 12 weeks (paid or not) and would start when you first leave even if it's before the baby arrives. If you're employer is willing to let you be out that long and hold your job, then that's awesome! Like @foersty, I'm due on the 7th and as of now I plan on making the 3rd my last day at work. I have a desk job that I really enjoy and I'm still feeling good enough that I feel like I can make it until the end. If I don't go into labor by the 8th I'll go into the hospital on the 9th to be induced, so I'm looking at it as taking a long weekend before baby's arrival. I would stay in work even longer but it doesn't really benefit me in any way to do so (I won't earn any more paid leave time or health benefit time by staying those last few days). My employer will allow me to take a year off and will hold my job the entire time, but I only get paid for whatever time off I use. I only have 3 weeks sick time so I intend to use that and then go on temporary disability for 9-11 weeks at 66% (how long they pay depends on the type of delivery). After that whatever time I stay out will be unpaid. My mother in law is planning to watch the baby once I return to work, the only problem is in order to do so she has to retire and she hasn't figured out when she is going to do that, so my return to work date is kind of up in the air at this point. I told her I'd like to be back to work by October the latest and she said she'll definitely be done by then, but I am kind of hoping she stops working a little bit before that so I have the option of going back to work sooner (and getting paid again lol). @RunBooRun Ya.. I didn't realize how good we have it here in California compared to other states. I found this timeline that helped me understand all the different laws/regulations regarding pregnancy leave. I actually had a co-worker out on maternity leave for 10 months due to pregnancy complications. Dang! I get 6 weeks paid (disability) through my company. 8 weeks if I need a c section. 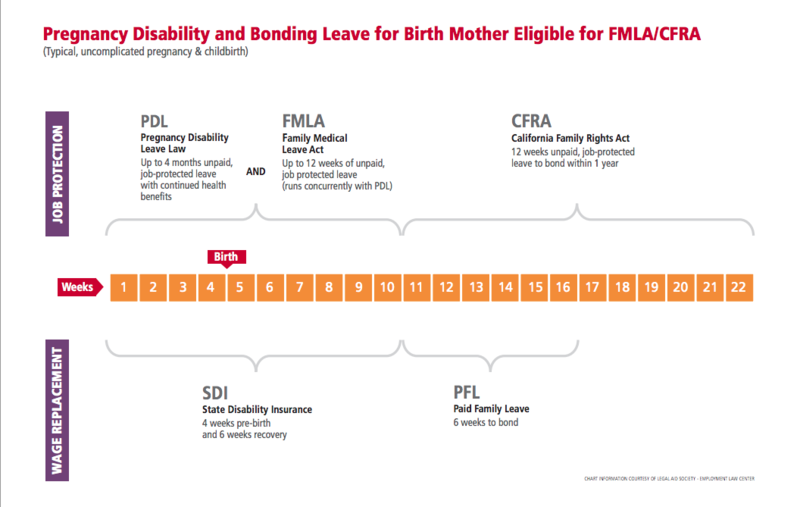 Then FMLA for the rest, up to 12 weeks total. Luckily I have enough PTO saved for the remaining to be all paid. I feel lucky to get that...my SIL works for a small office and they don't provide any benefits beyond FMLA so all she has are her 2 weeks paid vacation. Fortunately for her, her 12 weeks that she's taking off falls between calendar years so she got one week paid in 2016 and one week 2017 (she's saving one of her 2017 weeks for later in the year). Im in the same boat as others. 12 weeks of FMLA. I'll get 6-8 weeks paid via short term disability and also vacation/PTO banks. I'm taking the full 12 regardless if I get paid the whole time or not. We've been putting money aside to help with bills while I'm out if we need it. I'm a teacher. Youd think wed get awesome benefits. Nope. I do get 12 weeks FMLA by no dedicated maternity leave. Since I have exactly 2 days of PTO saved up, it will be entirely unpaid. As for short term disability, I can collect 66% of my paycheck...in theory. But this does not kick in until I have missed 20 days of work...so 4 weeks. And it only lasts until 6weeks postpartum. So in reality I will get 2 weeks of 66% pay. Butimso grateful for this, because I know I can take a leave of absence from work even past the 12 weeks and my job would still be waiting for me (if I wasn't in a one year contract anyway). And I know my boss is planning to rehire me for my job next school year. So I am blessed in that I have so much security and enough savings to make it until my next paycheck at the end of September. It's so infuriating that people like teachers get such terrible paid leave options. It seems like it's the same nationwide, at least for every teacher I've ever known. I work for a law firm -- places generally known for terrible work life balance, not family friendly, not great for women, etc etc. and I've had a terrible time being pregnant at the firm, but I'll get 5 months off and almost all of it will be fully paid once I actually go out on leave (I think like 2-3 weeks will be unpaid, and when I come back I'll be 'eased back in' slowly while fully paid). I don't understand why there's such a discrepancy, both in state minimums across the country and across different industries/companies/etc. my husband works for a nonprofit and gets 3 months off fully paid as a "non-primary caregiver," so it isn't just about money. This issue really infuriates me and I hate when high profile women brag about being back at work immediately, or working right up until their water breaks. That's great if it's what you want to do, but for every public figure who "chooses" to do this there are so many women who are forced to do it and are shown its apparently no big deal, when it really is. And the executives you hear about doing it have a tremendous amount of super expensive support at home. Working right till the end here too! With my first I went into labor on a Monday morning - i was due 2 days later. My water broke as I was getting ready for work. I fired up my laptop and did a few last things for work, set my out of office and headed for the hospital. I plan to do the same this time around too. unemployed here, but DH gets nothing, he has to dip into vacation days, which he only gets a certain amount for all calendar year, so we have to save some for if he gets sick, Christmas when all family will want to see baby.